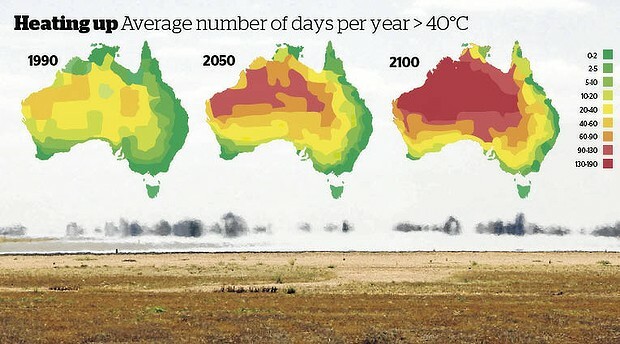 Australia's multibillion-dollar mining, farming and tourism industries face significant threats as worsening global warming causes more dangerous and extreme weather, the world's leading climate science body will warn. A final draft of a five-year assessment by the UN's Intergovernmental Panel on Climate Change (IPCC) - seen by Fairfax Media - details a litany of global impacts from intensifying climate change including the displacement of hundreds of millions of people, reduced crop yields and the loss of trillions of dollars from the global economy. The report is the second part of the IPCC's fifth major assessment and focuses on climate change's impacts and how the world might adapt. It will be finalised at a meeting in Japan next weekend before its release on March 31. The final draft Australasia chapter also outlines significant local threats if human-caused climate change gets worse, in particular high confidence that fire seasons, particularly in southern Australia, will extend in high-risk areas. There is also significant risk of increased damage and death from heatwaves resulting from more frequent extreme high temperatures. Flood risk too would be worse. * Tony Abbott declared some years ago that he doesn't believe in science, and states that "climate change" is a load of crap. * NO scientists, tehnologists, medico's, working farmers, or environmentalists/conservationists/preservationists, are among the governments front benches ! * Government abolished many scientific posts and advisory boards, as one of it's first measures..
* ANY punitive taxes and positive measures that "might" have been used to control or limit global warming processes and pollutants are being abolished, watered-down or changed so much as to be completely useless ~ as part of the Conservative government's promised policies. * The "Environment Minister" portfolio is given to a new young Liberal Party "yes" man, with zero credentials and experience in any life sciences. * AN "action team" set up to deal with practical "Climate Change" issues as they arise has a creationist non-believer among it's leadership panel ! * Mining bosses and corporate bosses have much more input into government policy making than the great majority of 'ordinary' Aussie citizens..